Although Freeform cancelled its Young & Hungry TV show last month, it’s not all over quite yet. The second half of the fifth and final season of Young & Hungry premieres on Wednesday, Jun 20, 2018 at 8:00pm ET/PT. In addition, the cable network has announced it is developing a Young & Hungry TV movie. 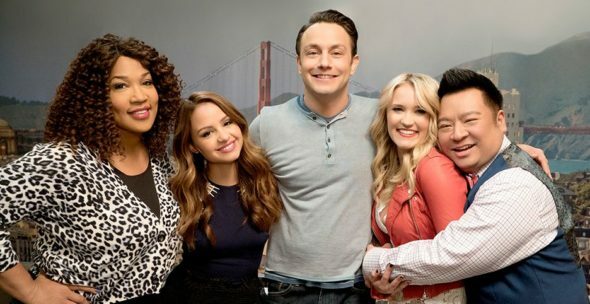 A live-action Freeform comedy, Young & Hungry stars Emily Osment, Jonathan Sadowski, Aimee Carrero, Kym Whitley, and Rex Lee, with Bryan Safi recurring. The sitcom centers on food blogger, Gabi Diamond (Osment), who becomes the personal chef of wealthy tech entrepreneur Josh Xander Kaminski (Sadowski). After they develop feelings for one another, the plot thickens. Learn more about the final season and the Young & Hungry movie from this Freeform press release. Freeform announced today fan-favorite comedy series “Young & Hungry” will return for its final season on Wednesday, June 20 at 8:00 PM EDT/PDT. The final season (5B) sees Gabi and Josh finally together and in love, but now navigating their new status as a full-fledged couple. Meanwhile, the rest of Josh’s staff, Yolanda and Elliot, are grappling with the change in work dynamic with Gabi as the “woman of the house.” Sofia, Gabi’s best friend, who begins to feel like a third wheel with the new couple, sets out on her own path to find love. Additionally, Freeform has ordered into development a “Young & Hungry” movie, from the same series creative team including David Holden, Caryn Lucas, Ashley Tisdale, and Eric and Kim Tannenbaum, that will further the adventures of Gabi, Josh and their circle of friends. “Young & Hungry” is produced by Holden, Lucas, Tisdale, Jessica Rhoades and Eric and Kim Tannenbaum in association with CBS Television Studios. Gabi Moskowitz, of BrokeAssGourmet.com, is a San Francisco-based food blogger and contributed to the development of this project. The series stars Emily Osment, Jonathan Sadowski, Aimee Carrero, Kym Whitley and Rex Lee. Freeform’s robust slate of original scripted series includes smash hit comedy “grown-ish,” and breakout series “The Bold Type;” along with buddy comedy “Alone Together;” supernatural thriller “Beyond;” “Famous In Love” starring Bella Thorne; critically acclaimed “The Fosters;” sci-fi phenomenon “Shadowhunters;” fan favorite “Young & Hungry;” the upcoming mermaid drama “Siren”, and the eagerly awaited series “Marvel’s Cloak & Dagger,” coming in June 2018. What do you think? Are you a fan of Young & Hungry? Should Freeform have cancelled or renewed this TV series for a sixth season? Will you tune in for the movie? Let us know, below. I seriously hope they do not cancel young & hungry this is my favorite show. I absolutely love Gabi and josh together. I just hope they come out with more seasons. I have never enjoyed a tv show more than this one. Loving it funny and entertaining should never be canceled but glad to see a movie this show totally rocks. Please don’t cancel Young and hungry I love this show. I watched from the beginning of the first season to the end of the fifth season, where gabi found out the engagement ring was for her. That Josh was going to purpose to Gabi when he heard she got a offer to fullfill her dream in Seattle. But she ends up purposing to Josh and ask him to come with her. You should do a 6th season to show what happens between Josh and Gabi. And if she goes to Seattle and if they get married too. PLEASE don’t cancel Young & Hungry!!! Love the show! There are very few good comedies anymore! It’s a fun feel good show! We need these with all the drama in the world today!!!!!! Omg!!! Please, please, please!!!!!! Bring this show back!!! Season 6 and a movie!!! My whole family loves young and hungry!! How could they end this show?! I just binge watsched it on Netflix! I love all the characters! I need more!! Please netflix take it over ive been binge watching this all weekend and you can’t end it plz. We need a movie or season 6. They better make a movie bc after 5 great seasons with these characters you cannot leave it hanging! I’ll be waiting! Okay, they can NOT leave us like that. do they get married or not?